The blog Three Sonorans has written a piece on why to vote against Prop. 107. All five of their arguments can be easily refuted. 1) The article claims that Prop. 107 does not come from Arizona. This isn't accurate. The Arizona State Legislature referred it to the ballot - every single Republican state legislator (except one who was absent) voted to refer it to the ballot. The article points out that funding for Prop. 107 - now that it is already on the ballot - comes from Ward Connerly's Civil Rights Institute, out of California. The article conveniently overlooks the fact however that virtually all of the funding for the opposition also comes from out of state - from unions, and one in-state union. Their biggest contributor to the opposition is the Service Employees International Union, based out of Washington, D.C. If they don't have a problem with their money coming from out of state and unions, why do they have a problem with the other side? At least Yes on Prop. 107 follows the law and puts "out of state funding" on their signs. The opposition committee doesn't bother to put that on their signs. 2) The article claims that discrimination is already illegal, under state law and the Constitution. State law prohibits some kinds of discrimination, and the Constitution vaguely prohibits discrimination, but the truth is reverse discrimination is occurring in many places. Every time a woman or minority-owned business gets a 7% bid preference from the City of Tucson, reverse discrimination occurs against the equally qualified bidder who bid less but was denied the contract. Every time a woman or minority is admitted to our universities over someone else equally qualified due to their race or gender, reverse discrimination occurs. Every time a woman or minority receives a faculty position at the University of Arizona that is denied to someone else due to their race or gender, reverse discrimination occurs. And these are just a few of the many places this is occurring in Arizona. Why should my daughter receive a benefit but not my son? Why should my half-Hispanic child receive a preference but not my other child? 3) The article claims that Prop. 107 is anti-Civil Rights and will roll back equal opportunity. Not sure what this vague statement means. If it means Prop. 107 will roll back race and gender preferences that cause reverse discrimination, well that's true. 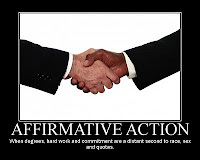 When affirmative action was implemented in the 1964 Civil Rights Act, it was only meant to stop discrimination against someone. Not push people ahead of others. Unfortunately extreme activists have turned the 1964 Civil Rights Act on its head, and gone way beyond the affirmative action it intended, morphing it into preferences which now reverse discriminate. Prop. 107 would eliminate that reverse discrimination and follow through with the true intent of the 1964 Civil Rights Act, which was to treat people equally and not discriminate based on race or gender. 4) The article says that Prop. 107 claims to be about ending quotas, but quotas don't exist in Arizona. This isn't true. Quotas blatantly exist everywhere, although the wording is disguised to pretend they're not quotas. For example, look at the University of Arizona's blatant quotas for faculty hires. They refer to these quotas as "federally mandated placement goals" instead of "quotas." Clever. But they're not fooling anyone. If they're not quotas, then what are they? They list a distorted quota goal of 63% women for Administrators at the Assistant Director Level. Women barely make up more than half the population! They want 53% of General Maintenance positions to go to minorities. These are outrageous and only some of many listed on that page. 5) Finally, the article claims that Prop. 107 will cost Arizona jobs, saying where it has passed in California, minority and women owned businesses went out of business. But there is no evidence that those businesses went out of businesses due to the initiative there - they could have gone out of business for other reasons. If anything, Prop. 107 will create more jobs, because it will take away the expensive bid preferences given to minority and women owned businesses that are costing taxpayers more money. Instead, the most cost-effective businesses will win the bids, the ones that are the most prudent about cutting costs, therefore creating more employment.